Much is being said about the S&P 500 breaking through its former daily high set in 2007. The question seems to be whether this is the end of a bull market or the start of a new one? First, let’s put this into perspective. Below is a chart of SPY – the SPDR’s S&P 500 Index tracking ETF showing monthly returns since 1997. Many pundits like to point out that we have been in a four year bull market, and therefore, this rally is extended and due to come to an end. This is simply false. What we have been in for four years is a bear market recovery, as anyone who invested prior to 2008 can tell you, we have simply had a long 4 year slog to recovery from the financial crisis induced crash. Figure 1 SPY 1997 – Present, monthly returns. Second, from a longer term secular reference, we have really been in a 13 year bear market and recovery cycle dating back to the 2000-2002 tech wreck market crash. 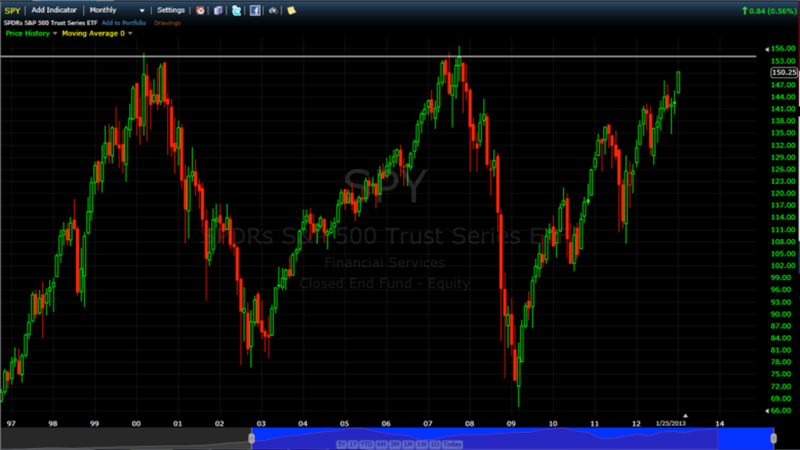 Since the market peak in March of 2000, we have not gone above, and stayed above that level for 13 years now. This is the definition of a secular bear market. The good news is that secular bear markets do end. 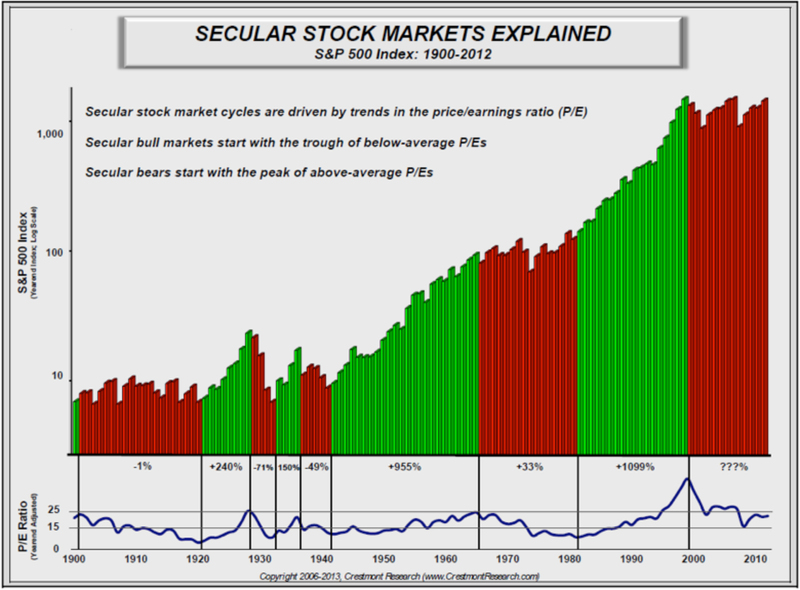 Below is a chart from Crestmont Research showing the history of secular markets in the U. S. since 1900. As you can see the market’s history consists of long periods of rising markets (green bars) followed by relatively flat periods (red bars). However, “flat” describes the period from beginning to end of the period. Flat periods, or secular bear markets, can be filled with large declines and recoveries. So are we going higher? Hard to say. I know you want an answer. My point is not that we are at the beginning or end of a bull market. My point is simply that just because we have re-attained prior market highs, does not in and of itself mean much of anything as to which way this market goes from here. It is simply not that simple. But it makes for good headlines. What I will say is this: The overall stock market is not “cheap” at these levels – in terms of corporate earnings. However, it is extremely hard to factor in just how much of an effect the Federal Reserve’s series of Quantitative Easings have had on valuations. In English – low interest rates make stocks more attractive. We have extremely low interest rates, albeit artificially low due to the Fed. If the Fed can successfully keep interest rates low this year, and without a major “event” the market could finally breech its former highs, and stay above them before the next bear market rears its ugly head. That said, in practice we remain cautiously optimistic. We continue to look primarily for undervalued dividend opportunities in our Dividend Growth portfolios. We are fully invested in our seasonal ETF growth strategies. Nice piece! Investing is a game of odds. Based on your chart above, it appears the average Secular Bear is 17-25 years. We are 12 into this one….so the odds are we are not done. The pros will roll this thing in the next few weeks or months! Good article Bill! Enjoy and appreciate your common sense and ability to break down the complexities of market activities for a common investor.